St. Petersburg, 11 March 2016. - Inzhtransstroy-SPB", the general contractor of the stadium construction on Krestovsky Island in St. Petersburg, reports the rise of the ninth block (out of twelve) of stadium's retractable roof in the evening on March, 10. The most complicated work will be completed by May. The roof of the stadium on Krestovsky Island consists of two parts, of the fixed - non-moving part – and the retractable one. During bad weather and cold season, the roof can be airtightly closed. Together with the climate control system, this will allow the stadium to maintain comfortable conditions all year round. Even in winter the temperature will be above 15 degrees Celsius. The sliding part of the roof consists of twelve blocks - six in each half, the northern and the southern ones. The blocks are assembled directly on the field, and then raised to a height of sixty-two meters by two cranes, with the lifting capacity of seven hundred and fifty and six hundred tons. Each block weighs more than one hundred and fifty tons. The whole procedure takes a few hours. On the roof the units are installed on special trolleys, which will then be moved and shifted with powerful jacks. In the evening on March, 10 the ninth 161 tons’ block was raised to the southern side, there are three more blocks left. Lifting and installation of all twelve units are expected in April. After this, the most difficult part of work at the stadium will be completed, so special attention of the builders is focused on the installation of the retractable roof. The field will be cleared from the cranes and it will be possible to complete the installation of roll-out field systems. The finishing of facilities in sector A at "0" mark are being completed. The floor tiling is finished, as well as wiring. From the sporting point of view this is one of the most important stadium sectors. The dressing rooms for athletes, warm-up areas, showers, trainers', referees' rooms are located there. The athletes come out to the field from sector A. The entire finishing of sector A should be completed by the end of March - except for the lay-in ceilings, which for technological reasons will be the last to be installed. To create the humid-thermal conditions inside the stadium, to eliminate the leaks and create a complete roof layout with bird's-eye view - the works to cover the fixed roof are being conducted. A special vapor barrier film is being placed on the roof, then the subsystem is mounted on, and after that the thermal insulation with an aluminum seam roofing on the top. All works on the roof are seriously affected by weather conditions, so the incoming of spring has significantly accelerated the process. Active work to hemming roof eaves, adjacent to the stained glass panels, is in progress. At a height of 35 meters they are mounted with help of long mobile telescopic derricks. The installation of seats for fans is continuing. As of today, 45,580 seats has been installed, which is nearly 80% of their total number. The planned rate of installation is 500 seats per day. The installation of stained glass panels is fully completed at mark "14". 80% of stained glass designs are installed at the highest, panoramic mark "42" (i.e., at a height of forty-two meters). Some stained glass panels will be installed later to leave some special openings for technological requirements, cabling, access to the outer facade etc. On the hill along the stadium perimeter, the work on casting concrete cascading staircases is in progress. Work on the stairs building began at the end of February, today it is 20% complete. Area around the stadium is being equipped. At the end of March, a small ring road 1.5 kilometers long will be ready for asphalt covering, and then work on the outer ring road will begin. The builders are entrusted with a task to complete the general construction works by the City Day on May, 27. 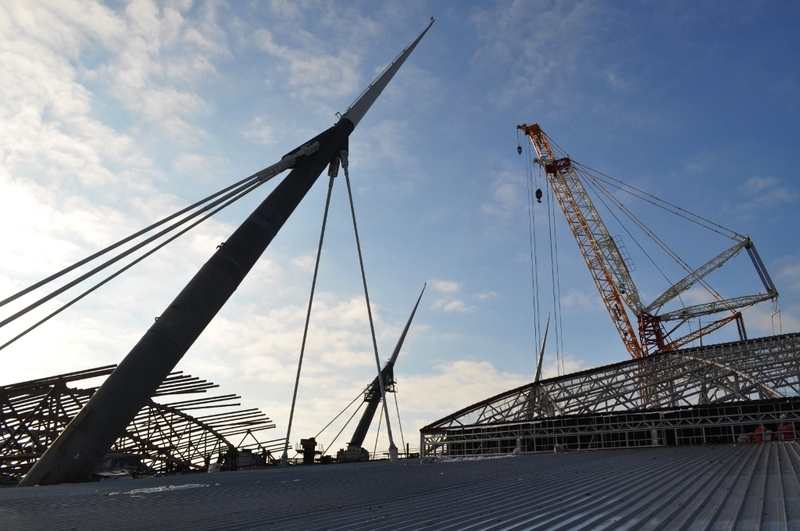 Further work will be carried out in the indoor stadium, as well as balancing and commissioning procedures. All works on the stadium in the western part of Krestovsky Island will be completed according to the current state contract in December 2016.